An exciting opportunity to research and receive a TESOL certificate for your own ESL experience and field of choice. 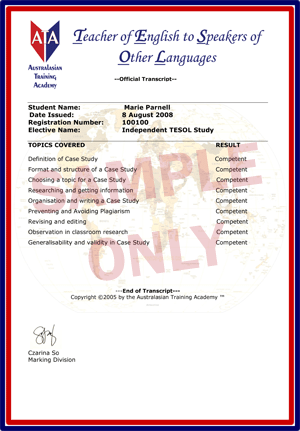 Independent TESOL Study is a must for TESOL teachers seeking international recognition for their own research, ideas and creativity. Independent TESOL Study provides the experienced TESOL teacher with the exciting opportunity to gain recognition and certification in a researched and chosen field of ESL teaching. Q: Can I choose my own area to do my case study about? A: Yes, all students are given a list of case study suggestions; however, you can submit your own field of choice to be approved for you case study.